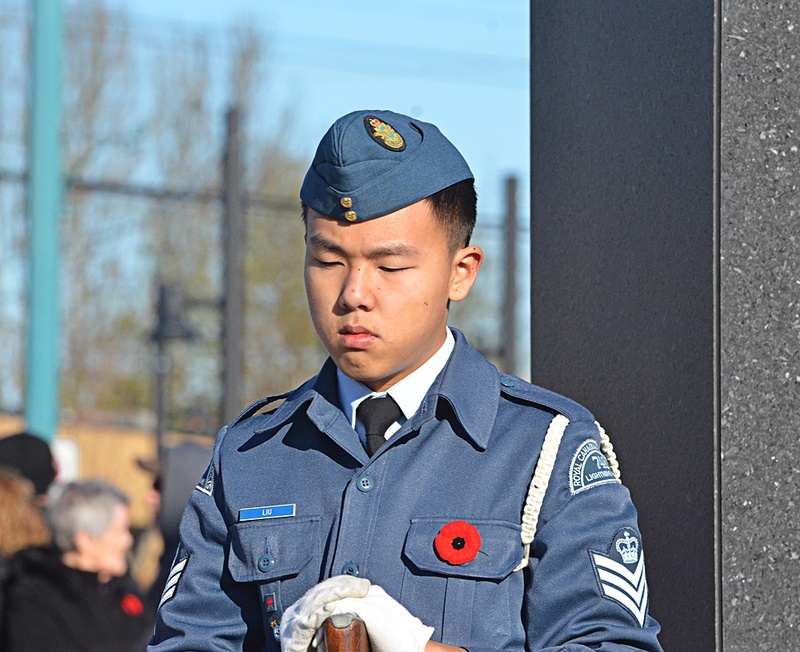 Nov. 12, 2014 1:00 a.m.
A crowd of thousands listened to the Last Post and stood for the moment of silence for Langley Cityâ€™s Remembrance Day. Among those at the front of the crowd were Langleyâ€™s Second World War and Korean veterans. â€œIâ€™ve never missed one Remembrance Day,â€ said John Swityk. Heâ€™s laid a cross every year since 1946, the first year he was home from Europe on Nov. 11. Swityk served with the Regina Rifles and was sent ashore on D-Day on Juno Beach in Normandy. With Swityk was his friend Rodger Oâ€™Brien, who served five years in the Royal Canadian Navy. Swityk laid the wreath representing veterans of the Second World War. It was one of dozens of wreaths laid amid the stiff breeze at the cenotaph in Langley Cityâ€™s Douglas Park. Wreaths were laid to represent veterans of every war from the First World War to the conflict in Afghanistan. The parade this year included not only a group of veterans of the Canadian military, but local Cadets groups, RCMP, City firefighters, and Scouts and Guides of various ages. The honour guard around the cenotaph was composed of young Cadets. The annual event is organized by the Langley branch of the Royal Canadian Legion.